Immerse yourself in the sights and sounds of a sustainable family farm raising livestock on 112 scenic acres in the Susquehanna River Valley. Sheep dot the rolling green hills, pigs doze in the sun, and horses frolic in the fields. Chickens, turkeys, beehives, and working border collies complete the picture. 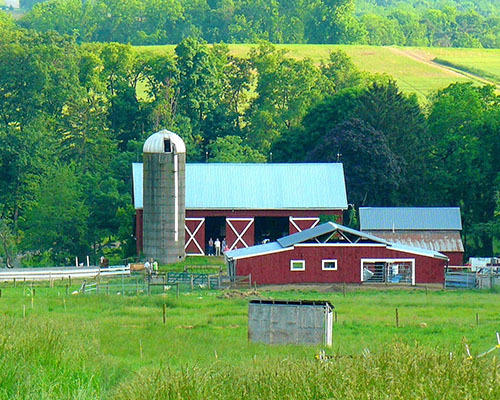 Your cozy guesthouse is at the heart of the farmstead, next to the Big Red Barn. Your visit is private and personal, because we host only one overnight group at a time. 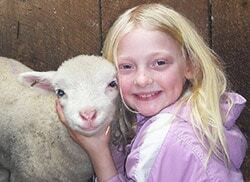 Authentic farm activities are yours to observe and/or participate in. Your guesthouse sleeps 6 and includes a fully equipped kitchen. You have free access to gardens, orchards, and berry bushes to supplement your meals. Despite our rural setting, the grocery store is just 10 minutes away. Reserve online!